Julius Castle, 1541 Montgomery Street. Only in film noir can someone who steals the identity of a dead friend and escapes to a lush life in the City be the hero of the story. Valentina Cortese is a concentration camp survivor who comes to San Francisco as the mistress of The House on Telegraph Hill. She quickly finds herself at the epicenter of danger when it becomes clear that bridegroom Richard Basehart and creepy governess Fay Baker are keeping secrets. 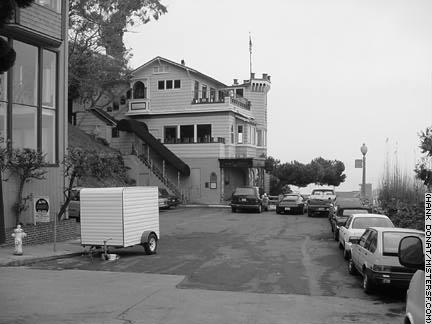 The thriller was filmed on Telegraph Hill and in North Beach in the latter half of 1950 by director Robert Wise and released the following year. It provides an excellent archive of upper Montgomery. A scene with Cortese careening out of control for several blocks in a car with no brakes is actually a wild ride down Union and Montgomery streets in all directions! She finally comes to an abrupt stop in a mound of dirt at Montgomery and Montague Place. (Five years after the film's release, Cortese and Basehart - who met on the film and were married from 1951 to 1960 - survived a three-car pile-up in Terracine, Italy. Two police officers were killed in the accident.) Despite many authentic San Francisco locations in this entry, the mansion known as "the house on Telegraph Hill," is a composite of the Julius Castle site and special photographic effects by Fred Sersen. The address given in the script, 200 Jackson Street, is Kokkari Estatorio, a Greek restaurant in the Financial District.